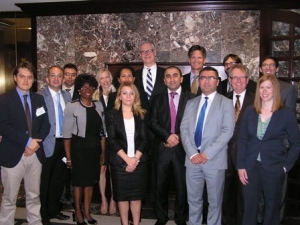 A delegation of six judges from the Republic of Turkey were recently in Oklahoma City to observe the workings of American democracy first-hand. As a part of their eight day tour, the visiting jurists were hosted by the GableGotwals Oklahoma City office where they met several attorneys and were then told of how the mediation process works in Oklahoma by Steve Barghols. The Turkish judicial system involves a trial before a judge alone and no trial by jury system. They were uniformly impressed with the mediation process that is currently in place in Oklahoma, and said that a somewhat similar program is being started in Turkey. The group was sponsored by Rotary International and the Open World Foundation, which was created by the U.S. Congress in 1990 to provide advice and support to the states that had formerly been part of the Soviet Union that were seeking to create democratic institutions after decades of communist rule. While in Oklahoma, the group also visited the University of Oklahoma Law School; met with Oklahoma County District Attorney and an Oklahoma County public defender; toured the Oklahoma Supreme Court building, the National Cowboy and Western Heritage Museum, the Chickasaw Cultural Center and Oklahoma City Community College and gathered in Judge Miles Legrange’s office to discuss their experience.